Artist C. Ryder Cooley doesn't talk about her work in terms of how she created a set or a character. To hear her tell it, the characters and sets come to her in dreams and visions, and it's up to her to take those bits of information forward and backward, simultaneously developing them into workable ideas and sussing out their origins. Through her work with animal themes, she focuses on concepts such as the connection between humans and animals, the destruction of animal habitat and extinction. On the surface, her performances incorporate music, aerial acrobatics, taxidermy and costume to create a kind of fairytale atmosphere. But behind that is a desire to evoke emotion about the current state of chaos and change affecting the world's animal populations. She spent the past several years in living in Troy, where she worked on her Master of Fine Arts degree at RPI and developed the stage show Animalia as her master's thesis. And after performing it at Proctors in 2009, she set it aside. 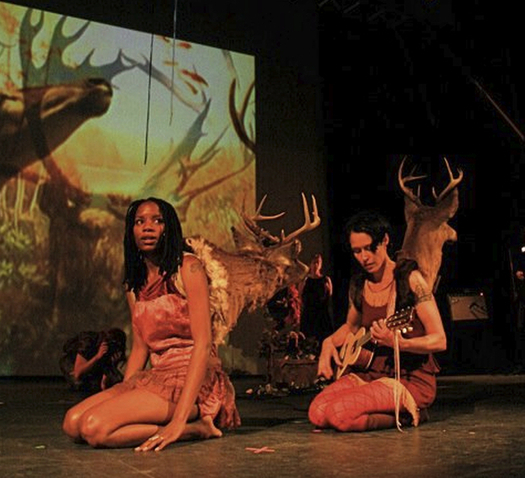 But like the deer/human hybrid woman who died at the end of the show, Animalia never really went away. It was just reincarnated into its next life. Last year, when Cooley moved to Hudson, her followup piece, XMALIA, rife with themes of death, came alive. The work picks up where Animalia left off, exploring a fantastical world where the extinct species such as the Tasmanian tiger, the Pyrenean ibex and the Xerces butterfly conspire with the recently deceased half-deer half-human woman (played by Cooley, of course). XMALIA's Songs of Extinction feature Cooley on her ukulele and saw, singing gentle songs to taxidermied approximation of these mythic beasts. If this all sounds pretty outlandish, it's because it is. It's also wildly engaging and moving. And that's what Cooley is going for. She wants to get humans thinking about what's we're doing to our planet and the other species with which we co-exist. But at the same time, the show doesn't jam politics down the audience's throat and relies more on the atmosphere to make the statement. We talked to her about the politics of extinction, taxidermied animals and her dodo bird trapeze act. XMALIA seems like a natural progression from Animalia. How did it come about? As I was wrapping up Animalia, I had an idea to do a piece about extinction. I want to keep this project alive. I feel like XMALIA can stay alive even though its about creatures dying. It's about looking at the life that exists in death and extinction. It's important to look at extinction on a scientific level and an ecological level, but it's also important to look at creatively. People are saying we're in a new wave of extinction, like the Ice Age. XMALIA is about creating things out of death and also creating ways to structure our memories so we can remember those animals that are going. What does the word XMALIA mean? I had an old spelling, but people would never figure out how to pronounce it. So then I took the X for extiniction and replaced the animal in Animalia with that. At the end of Animalia, the main character crashes into a deer and dies. She comes back as a hybrid being that can fly. Animalia had a happy ending. The character gets to fly, but dies. XMALIA starts there. She's gets on the train to travel to the big city to find her way in the world. But the train doesn't stop. It keeps going and she realizes she's the only one on the train. It stops in a small town that is completely abandoned. The whole town is a cemetery for extinct animals. As she walks around, she finds the graves of different extinct animals and sings songs for them to bring them back to life. It's very Twilight Zone-y. How much is involved in putting on the show? Right now, the full show is about seventy minutes. I am going to keep writing songs about extinct animals or vanishing animals, so new songs might show up at some point, or I might swap one song out for another to keep it fresh. I would like to be able to do this show for a while. So far, I've only done the full show twice. In addition to singing and playing, I'm doing trapeze and a harness aerial. I have a band with four or five musicians, and Lady Moon, who is an amazing dancer, singer and autoharpist I met in Hudson. Everybody else I find as I need them, so it's not a real solid cast right now. How did you end up performing XMALIA at Proctors last month? When I was doing Animalia, Caitlin Foley, who worked at Proctors, saw the show in Troy and asked me to do something at Proctors. Originally, she wanted me to have an exhibit, but then I asked if I could perform on the main stage and it worked out. With XMALIA, we took it to the next level. I worked with an organist. The organ there comes up out of the ground like it's coming out of a coffin, so that fit in perfectly. I had a large set, epic lighting and there was more movement. I just went to town. So now I'm doing some smaller shows, and I'm trying to get a tour together for the spring. And I hope to perform in more large venues locally too. What's up with the taxidermy animals? The taxidermy carries over from Animalia, where I had the deer head. Now I have different taxidermy animals that have come into my life, playing the roles of extinct animals. A tiger head plays the role of the Tasmanian tiger, a sheep plays the role of the ibex. A deer piece plays an ancient, giant deer. Figuring out how to make all of this work has been interesting. They are committed members of the show, they can't move away. In a way, that makes sense, since these animals we are dealing with are gone. I'm an artist, not a scientist. I can't try to be scientifically accurate, have to try to recreate some kind of essence of the animals. Took me a while to figure out that I could use taxidermy animals. Then I said "It's OK, I'm an artist. It's kind of sci-fi." There's an absurdity to it. The XMALIA gallery/exhibit is on view through Oct. 16 in North Adams, 18 Holden St. The next full performance of Xmalia is January 25< a href="http://www.mcla.edu/About_MCLA/Community/bcrc/mclapresents/">at MCLA Presents in North Adams.